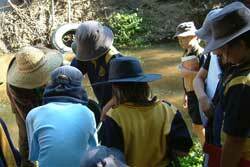 Down at Your Local Creek (DAYLC) was a special project in 2007-2009 aimed at upper primary students (years 5-7) from schools in the catchment of Kedron Brook. However, the program was adaptable to cater for students from year 4 as well. DAYLC was an interactive program providing students with an opportunity to learn about and protect their local waterway environment by developing their understanding of catchments, land use impacts on waterway health, and the use of ecological monitoring to make decisions. The program was designed to instil a sense of environmental stewardship and to provide students with the knowledge and awareness required to protect local waterways. The program involved two sessions. A classroom session and an outdoor session.The classroom session enhanced the learning outcomes of the outdoor session by introducing concepts and preparing students for action. The classroom component was facilitated either by the Kedron Brook Creek Ranger, a KBCB educator, or the teacher, while the outdoor activities were facilitated by educators with experience in waterway monitoring. The Branch’s aim is to protect and improve the environment of Kedron Brook by encouraging communication, coordination and education of those who live in, manage and influence the catchment. Working with schools in the catchment is a key strategy to help achieve this aim. Members of our organisation have worked with a number of Kedron Brook schools over the years to this effect. Through this program, we aimed to provide a quality learning experience that linked with curriculum outcomes, and was locally relevant and interesting to students in a structured and consistent way. Our branch continues to assist local schools through advice and visits to teachers responsible for environmental subjects within their schools within the catchment. Refer to our Contact us page and Education pages for further information.